The ViewSonic PJD7720HD delivers an awful lot for $530, starting with image quality that scores well for the price on contrast, on holding detail, and on neutral well-balanced color. Notable extras include a 10-watt speaker that delivers far better audio quality and higher volume than you would expect from such a small projector. And even with our video optimized settings it is bright enough--using a 1.3 gain screen--for a 150" diagonal 16:9 image in a dark room. Turn on some room lights and it will still deliver enough power for a 95" screen. Low Lamp Mode. Eco mode reduces lumen output by about 27% in all color presets. Video Optimized Lumens. For film and video, turning Brilliant Color off in Movie mode and tweaking the color settings slightly delivers acceptably neutral, natural-looking color, at a measured 870 lumens. That is much lower than the factory defaults with Brilliant Color on, but it is still bright enough to light up a 135" diagonal 1.0 gain screen in a dark room, or an 85" image with moderate ambient light. With a 1.3 gain screen, the sizes jump to 150" in a dark room and 95" with ambient light. In side-by-side comparisons with the other sub-$700 models, color is a touch less saturated than it should be, but viewed on its own it does not look undersaturated. Similarly, the PJD7720HD scores a bit lower than most of its competition for contrast and sense of depth. Video Performance. Although turning Brilliant Color off gives you optimum video balance, it also reduces lumens. If you need the full lumen power of the projector for a larger screen or a higher level of ambient light, the Movie, ViewMatch sRGB, and Standard all offer bright images with picture quality right out of the box that's good enough for casual viewing. Close ups of faces look a little less defined with ViewMatch sRGB than with Movie mode because there is less subtle shading. Standard mode takes that effect a bit further but it also offers better contrast than either Movie or ViewMatch sRGB. In Dynamic mode, the loss of subtle shading crosses the line into fairly obvious posterization (where faces look flat, as in a poster drawing) and the default setting adds a green bias that shows in some scenes. In Brightest mode, both the posterization and green shift are even more obvious. Both are at a level you might accept as tolerable for a TV substitute in family room for occasional use when bright sunlight is streaming through the windows. Nevertheless, image quality is lower in the brightest modes on all projectors and by comparison, the PJD7720HD's image quality in Brightest mode is far better than for the brightest modes of several of the projectors in this sub-$700 group. 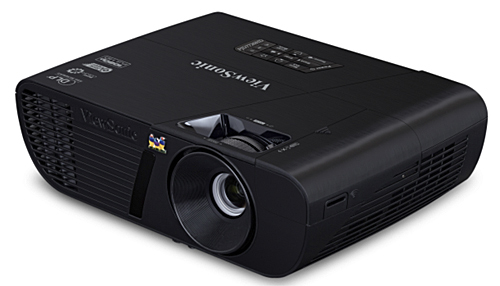 The only projectors that do better in their brightest modes are the Epson Home Cinema 1060 and ViewSonic's other two models, the PJD7828HDL and Pro7827HD. Zoom Lens Effect on Brightness. With only a 1.1x zoom, the lens curtails too little light at the full telephoto setting to matter when considering placement. Brightness Uniformity. The PJD7720HD's brightness uniformity is 54%. That's relatively low, but the variation is hard to see with any image that breaks up the field of view. Input Lag. With default settings, the PJD7720HD's input lag is only 33 ms with every predefined color mode. Turn on FX Fast Input, and it drops to a very rapid 16.4 ms, which is the best it gets for serious video game response for any category of projector. On-board audio. The 10-watt mono speaker delivers surprisingly high quality sound for such a small projector and enough volume to fill a mid-size family room. Fan noise. The PJD7720HD's fan noise is a bit lower than most of the projectors in this sub-$700 group, although it is not as quiet as the Optoma HD29Darbee. In Normal mode, it is somewhat quieter than most, but still loud enough to notice from anywhere in a typical room in quiet moments. In Eco mode, it matches most of the competition, with a low enough volume so few people will notice it in a room with ambient noise. More will notice it in a quiet home theater. Sound quality in both modes is a steady white noise. In High Altitude mode, the sound is louder and adds a high pitched overtone, making it potentially intrusive in quiet moments even in a room with ambient noise. The HDMI/MHL port is in a hidden compartment on the left side as viewed from the rear. It is meant for a wireless dongle that does not need a separate power connection. For dongles that need a power connector, or if you want to use the port with a second external source, you have break off a punch-out piece of plastic and run a cable through the hole and over the top or side of the projector. Throw distance. For a 120" diagonal 16:9 image, the PJD7720HD requires a throw distance of about 13 to 14.3 feet. If you like to sit at a distance of 1.25x the screen width (a comfortable distance for a lot of people) your seats would be about 11 feet from the screen. So the projector would be two or three feet behind the seats. The ViewSonic PJD7720HD Projection Calculator will help you find the throw distance range for the image size you want. Lens offset. The PJD7720HD's lens offset is appropriate for installation upside down in a ceiling mount or placement on a low bookshelf or the like behind the seating area in a small room. With the projector sitting on a table, the entire image is above the centerline of the lens, with the bottom edge of the image about 10% of the image height above the center line. Putting the projector on a high shelf behind the seating area, so you have to tilt it down and then adjust the keystone, is best avoided. Doing so will tend to introduce artifacts in fine patterns in the image. It eliminates the ability to get a one-to-one pixel match between the 1920x1080 display and a Full HD 1080p source signal. The ViewSonic PJD7720HD is a surprisingly capable projector for $530. On both our horizontal and vertical test images, with alternating one-pixel wide light and dark lines, the PJD7720HD held the full resolution, edge-to-edge. And it rarely shows rainbow artifacts. With color movies we saw them only with white text superimposed on a dark background. The sole 3D mode is dimmer than typical as compared with 2D, but we saw no crosstalk or other 3D-related issues. With video optimized settings, the measured 870 lumens is bright enough in tandem with a 1.3 gain screen for a 150" 16:9 image in a dark room or a 95" image in a room with moderate ambient light. Color saturation comes out a touch short but not by enough to notice without the direct comparison with a reference image. Beyond that, the 16.4 ms input lag makes the PJD7720HD an obvious choice for gaming. And at 5.3 pounds with very good audio on-board, it is also a strong candidate for moving room to room or to the backyard for a movie night. This particular constellation of features makes the PJD7720HD a good choice for classic home theater. It is also one of our top picks in the sub-$700 group for family-room TV substitute, for video gaming, and for transporting as needed to different locations.